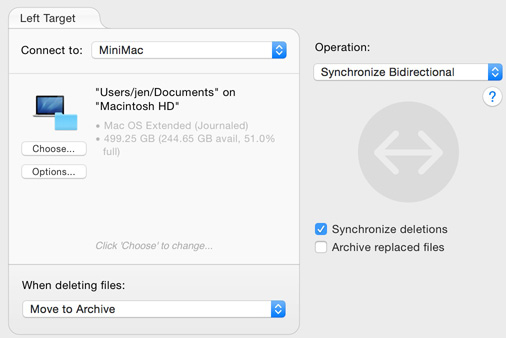 This guide explains the procedure for creating a ChronoSync Synchronizer document to keep each of the following Home sub-folder in sync between two Macs. There is a structured set of steps that must be followed to use ChronoSync for the Music folder which contains the iTunes Library. This guide covers the steps necessary to successfully sync the Music folder between two macs. ChronoSync can not merge two different iTunes libraries into one but it can keep them in sync once they are the same. 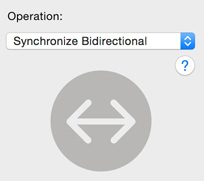 This guide is linked as part of the "Sync The Home Folder Between Macs Using ChronoSync" Guide but can be used stand-alone to setup a synchronizer document to keep either or both of the above folders in sync between two Macs. If you are syncing 'Desktop', 'Documents', 'Public', or 'Downloads', then follow this Guide instead: "Syncing The Desktop, Documents, Public, or Downloads folders between two Macs." Home folder syncs must only be done between identical versions of macOS. For example, do not attempt to sync between Mountain Lion and Mavericks, and avoid syncing between different versions of the same OS (10.10.1 vs 10.10.2). Also for Home folder syncs, ensure all apps such as iPhoto, iTunes and iCal are the same version. Of course personal files, including documents, raw media files, downloads, etc., can be synchronized or backed up to any OS version or any device accessible via Finder using the Mac ChronoSync is installed on. Never attempt to sync files outside of the home folder such as 'Applications', 'System', or 'Library' between two Macs. Problems can arise if Applications, or System files are synced that can easily result in application failure or a corrupt OS. In syncing two Macs, the focus needs to be on the home folder and the data files stored therein. Make sure you have the same version of iTunes on both Macs in order to synchronize the Music folder which contains your iTunes Library. However, music files, like .mp3 files, can be synced between any OS that your Mac can copy to, including Windows. The Music folder is where music and audio files are generally stored. It is also the location of the iTunes Library. The iTunes Library is a folder that stores all the music files in a complex way. ChronoSync can not merge two different iTunes libraries into one but it can keep them in sync once they are the same. The iTunes Library can be synced back and forth between two Macs as long as a few rules are followed: always run the sync when switching Macs and always run the sync from the same Synchronizer document. ChronoSync cannot merge two dissimilar iTunes libraries. The first step in syncing the Music folder is to create a master iTunes library on one of the Macs. This guide assumes that you use the ChronoSync Mac to create the master iTunes Library. There are other applications that will merge iTunes Libraries, just search the Mac App Store. Also, you can read Joe Kissell's article on how to Merge two iTunes Libraries. Of course, this all assumes that you don't already use iCloud/iTunes to keep your iTunes Libraries in sync. If that is the case, you don't need to go any further and instead allow iCloud/iTunes to handle keeping the libraries in sync. It is suggested that if you do use iCloud for synchronizing this type of media, you should simply exclude your iTunes library from any home-to-home syncs that you may be performing, using the Analyze panel's Exclude function. On the Mac that doesn't have the master iTunes Library, make a backup of the Music folder before running any syncs. You could simply drag the Music folder to your desktop, or use ChronoSync to create a backup of that folder on an external drive or NAS. Open the Music Folder on the Mac that does not have the master iTunes Library and drag the contents to the Trash. You need to start with an empty Music folder so that the first sync will result in everything from the Master Library on the ChronoSync Mac replacing all Music files and folders on the non-ChronoSync Mac. Be careful not to delete the parent Music folder located in your Home folder. In this example, choose the Music folder for the Left Target by navigating to your home folder, selecting the 'Music' folder, and clicking 'Select'. You can also substitute the 'Pictures' for the chosen folder, if that is the desired folder. If you are syncing 'Desktop', 'Documents', 'Public', 'Downloads', or 'Movies', then follow this Guide instead: "Syncing The Desktop, Documents, Public, or Downloads folders between two Macs." If you are following the "Sync The Home Folder Between Macs Using ChronoSync" Guide, then repeat the above Steps 1 through 8 to create a separate synchronizer document for each of the Music and Pictures folders you wish to keep in sync between the two Macs, then return to Step 4 in the above-linked home folder sync document. If you are using this Guide stand-alone to setup a synchronizer document to keep either of these two folders in sync between two Macs, then continue here with Step 9. It is recommended that you run a Trial Sync the very first time you perform the synchronization. That way, you can peruse the Trial Sync results to make sure you haven't made a simple configuration mistake such as selecting an incorrect target. If it looks like a lot more files than you expect will synchronize, or a sync in a direction you didn't expect, you should take a step back and double-check your configuration. Since you need to synchronize every time you switch Macs, it is not practical to schedule your Home to Home Container document. Instead, you should manually run the sync every time you switch Macs to ensure the two Macs always stay in sync. Doing this will take some getting used to, but it's a habit that should be practiced.